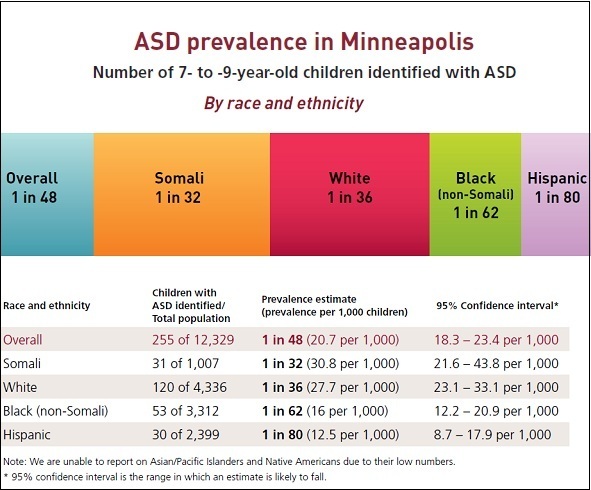 An important new study from the University of Minnesota has been published regarding the Autism Spectrum Disorder (ASD) population in Minneapolis. The results: ASD overall rate: 1 in 48. Another major finding is in the Somali population autism rates are 1 in 32. In October 2010, a Minneapolis-Somali mother asked the federal Interagency Autism Coordinating Committee (IACC) to investigate reports of high numbers of Somali preschoolers with autism. Her concerns were backed by preliminary information from the Minnesota Department of Public Health. In response, Autism Speaks, the National Institutes of Health and the Centers for Disease Control and Prevention (CDC) partnered to further investigate. According to the 2010 American Community Survey, Minnesota’s Somali population is the largest in the United States. The number of people of Somali ancestry in the state is approximately 32,000, with an estimated 85,700 living all across the United States. What did the project find? The analyses were conducted by project staff at the University of Minnesota and the Minnesota Department of Health (MDH). These findings were then independently verified by data analysts at the CDC. So, after three years we were able to collect data on only one U.S. city. I believe that if the government cared enough to count THE ENTIRE UNITED STATES ASD POPULATION, this is the rate we would have across the board. I want to thank Idil Abdull, Parent and Somali American Autism Foundation co-founder, for initiating the request for this study. She is one of the few bright spots on the IACC along with Lyn Redwood from Safe Minds. Perhaps we could ask the next question – how do we get an accurate accounting of the entire U.S. by age group of those living with autism? It’s time we stop guessing. Every taxpayer/parent should be asking: Why is the rate of autism so high and what are we doing about this epidemic? We are being bombarded with toxins from every angle, in the food(gmo’s/toxins), water, air and we are being spraying with an aluminum, barium cocktail (nanoparticles) from the skies almost every day now.(experiment ?) Just look up at the lines in the sky and watch them do there work. Google up “What are they spraying on us”, Geoengineering or Solar radiation management or Weather modification. Patent for weather modification done in 1987. And now fallout from Fukushima. How much can the immune system take? We all need to wake up! Autism rates are usually released just before holidays. Media can sweep it under the rug quickly–got move on to the hot topic of last minute Christmas shopping and stories about Santa. But there’s no hiding the truth, no matter how much you fiddle with the numbers. It’s in every family, every school and every community. The question of WHY Somali immigrants have a higher incidence should be explored. Over-vaccination (something that happens when US authorities assume that no record of vaccination from the home country means that the child did not recieve them or simply discounting foreign documents and requiring a complete “catch up” vaccination schedule for an immigrant child) seems more likely than genes, and over-vaccination is happening for a lot of immigrants. It’s also common in foreign adoptions. I wonder what the incidence of autism is in those populations (which are children of many races). Well in living here I have a few comments. First off I think the national level is closer to what was found in MN than what the CDC reports. In addition, vitamin D levels are low here and until 2008 this was not tested in pregnant women. Two years too late I found out I was a 19 when pregnant with my son. Secondly you would not believe how much Tylenol is the catch all here. It’s sick how much it is used. In addition western medicine is huge here. We have eight national hospitals here including MAYO. Vaccination rates are high and in speaking with Somalian moms at therapy centers they said they were coerced to do catch up vaccines upon arrival. They thought nothing of it as autism is practically non existent in their country so autism never crossed their minds. And I know not a single mom who researched and stopped vaccinating additional kids that has a second child on the spectrum. To date, the past three presidents have done little to affect positive change for families living with autism. We may blame lots of different reasons, why Somalian have a higher number of ASD. However, the bottom line is that we are all struggling with this unknown disease. I am Somalian, and I have never heard in back home such disease, nor never known its name, before it was diagnosed with my daughter. First, we blame the vaccination, but after eight years; here we have another daughter with ASD, and no vaccinations what do ever. Therefore, I don’t know what to blame. We. Live in San Diego, and there are a big number of Families, who are living with ASD. And, so far there are no study has been done in San Diego. Why are Somalian have higher number of ASD. The result of the higher number some Families stop or delay to vaccinate their children, and some others stop permanently to have any more children. Moreover, as parent, I wish that we have here in San Diego same study as Minnesota. We all need to Write a Letter to the Government ‘President Obama as a state of Emergency that we need help with our children with Autism right away this is an Emergency Autism has been pushed to the side to long Autism needs help. Can it be that Somalian’s have a different genetic make up that has not been subjected to generations of vaccination or exposure to these diseases they are being vaccinated with could that be the reason. Also, please see that the black and Hispanic children have autism at a lower rate, why is that? Could that be because they have a lower overall rate of full vaccination? Autism has nothing to do whether you have all of the vaccination or not. Matter fact some vaccination itself cause the disease itself, all of the Somalian children who have the ASD has born in US. Therefore, that is the why, some Somalian call the Autism [American Disease] we don’t even have a name in the Somalian language. I believe that we need more study, and research on the Somalian community, and find the reason why there is more cases of ASD.